Home / FAQ / FHA / What credit score do I need to get an FHA loan? What credit score do I need to get an FHA loan? Credit score requirements vary from lender to lender, but the FHA single family home loan minimum credit score requirement is 580 for maximum financing (requiring a 3.5% down payment). 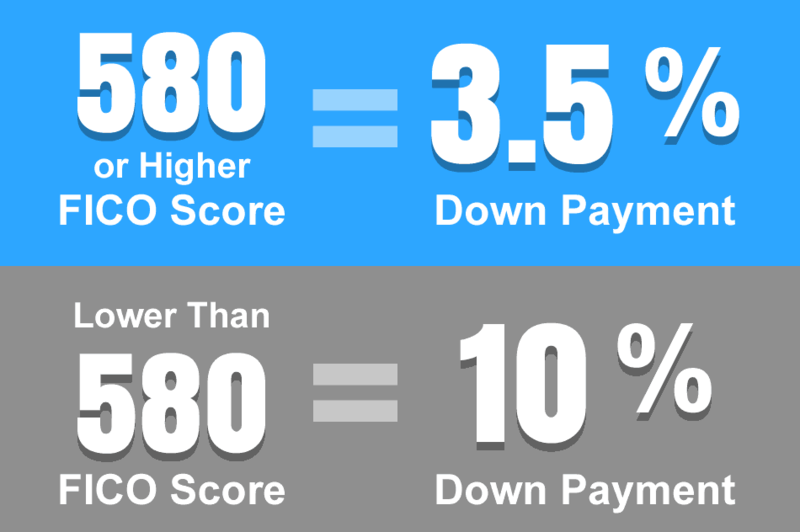 If your credit score is lower, you may still qualify, but your down payment requirement will jump to 10%. Keep in mind that these are standards set by the FHA. Lenders will have their own requirements and may ask for FICO scores of at least 620 or 640. FHA loans are designed to help home buyers, so these government-insured loans usually come with more lenient requirements than typical mortgages or refinancing terms from traditional lenders. While the benefits don't vary much between someone with good credit and excellent credit, there is a very noticeable margin for those with bad credit and average to good credit. FHA credit requirements address more than just your FICO score. Eligibility is also based on your payment history, as well as past bankruptcies and foreclosures. Extenuating circumstances, like job loss, may be taken into account, but willfully neglecting your debts can lower your chances of getting a loan.